Cystic lesions of the pancreas represent a heterogeneous group, as some of the lesions are benign (nonmucinous), whereas others are malignant or have potential for malignant transformation (mucinous cysts). The diagnostic workup includes clinical history, computed tomography, magnetic resonance imaging, and/or EUS. Furthermore, EUS can be combined with fine-needle-aspiration (FNA) of cyst fluid to further increase the diagnostic yield. The concentration of carcinoembryonic antigen (CEA) in the cyst fluid is still considered the most accurate marker for differentiating between mucinous and nonmucinous cysts (75% of sensitivity and 84% of specificity for a cutoff value of 192 ng/mL). However, when it comes to predicting malignancy, both sensitivity and specificity of CEA decrease to 63%. A meta-analysis evaluating the diagnostic accuracy of EUS-FNA cytology for differentiation between benign and malignant intraductal mucin-producing neoplasms (IPMNs), presented a pooled sensitivity and specificity of 65% and 91%, respectively. Conclusively, there is need for novel preoperative modalities to reliably discriminate between high-risk and low-risk cysts. Recently, a through-the-needle microbiopsy forceps (Moray™, US Endoscopy, Mentor, OH, USA) has become available. The instrument has a sheath diameter of 0.8 mm and a jaw opening width of 4.3 mm [Figure 1]. It can be introduced through a 19G FNA needle, after puncturing a pancreatic cystic lesion. Consequently, it enables histological specimens from the pancreatic cyst wall to be obtained [Figure 2] and Video 1]. The aim of this study was to evaluate the feasibility and safety profile of the new microbiopsy forceps in a multicenter clinical setting. The study was carried out as a multicenter audit on the use of this novel microbiopsy forceps which was agreed on the direction of each participating department as per local practice. Patients referred for EUS evaluation of a pancreatic cyst and attempted EUS-guided microbiopsy procedure were included retrospectively from six international tertiary centers. A standardized data collection sheet including the information about the patient demographics, cyst size, EUS/FNA findings, puncture site (stomach/duodenum), type of needle used, adverse events, technical and clinical success, and the results of the histological analyses was sent to the collaborating centers. Technical success was defined as successful puncture of the pancreatic cyst, subsequent successful mounting of the microbiopsy forceps, and extraction of at least one microbiopsy. Clinical success was defined as procurement of useful histological results. Adverse events were defined and classified in accordance with the American society for gastrointestinal endoscopy lexicon for adverse events. Procedures followed were in accordance with the ethical standards of the responsible committee on human experimentation (institutional or regional) and with the Helsinki Declaration of 1975, as revised in 2000. Informed consent was obtained from all patients included in the study. After EUS examination of the lesion and subsequent puncture with a 19G FNA needle, the microbiopsy forceps were introduced and microbiopsies were obtained from mural nodules or septae when observed. Otherwise, random microbiopsies were taken from the cyst wall. In case of a mixed solid-cystic lesion, supplementary FNA with a 22G needle was performed from the solid part. Finally, the cyst fluid was aspirated and sent for biochemistry (tumor markers and amylase) and cytology analyses. Microbiopsies were fixated in formalin overnight and embedded in liquid paraffin wax the following day. The tissue was cut into series of sections, mounted on glass slides, and stained with standard hematoxylin and eosin (H and E) and supplementary immunohistochemical staining when indicated. Descriptive statistical analysis was performed–the variables were presented either as mean with standard deviation (SD) (for normally distributed continuous variables), median with interquartile range (IQR) (for nonnormally distributed continuous variables), or number with percentage (for categorical variables). Normal distribution was tested using the Shapiro–Wilk test. A total of 28 patients were included in the study [Table 1]. There was a slight overrepresentation of female patients (n = 15, 53.6%) and the mean age was 65.5 years (SD = 11.8). The results are summarized in [Table 2]. Expect Flex Slimline™ 19G needle (Boston Scientific, Marlborough, MA, USA) was used in 18 cases (64.3%), while EchoTip™ 19G (Cook Medical, Bloomington, IN, USA) was used in remaining 10 cases (35.7%). We report a technical success rate of 85.7% (n = 24). Technical failure (n = 4, 14.3%) was due to inability to access the cyst while the echoendoscope was maximally flexed and were observed in lesions located in the head (n = 3) and the tail (n = 1) of the pancreas, the latter with failed transgastric puncture. Expect Flex Slimline needle was used in all four cases. Technical difficulties described apart from the above, included difficulty of pushing the instrument through-the-needle (n = 4, 14.3%), and difficulty of visualizing the forceps on EUS scan (n = 2, 7.1%). However, the technical difficulties mentioned did not hamper procurement of microbiopsies. A mean of three microbiopsies was obtained per patient (SD = 1.2). The mean procedural time was 31.9 min (SD = 12.7 min). In general, the quality of the microbiopsy specimens was good [Figure 3]. A certain histopathological diagnosis was achieved in 19 patients, whereas one microbiopsy was not diagnostic, but supported clinical and EUS findings (overall clinical success of 71.4%). Among these, there were thirteen cases of IPMNs, two serous cystic neoplasms (SCN), two cystic neuroendocrine tumors (NET), one mucinous cystic neoplasm (MCN), one mucinous cystic neoplasm with associated adenocarcinoma, and one pseudocyst. 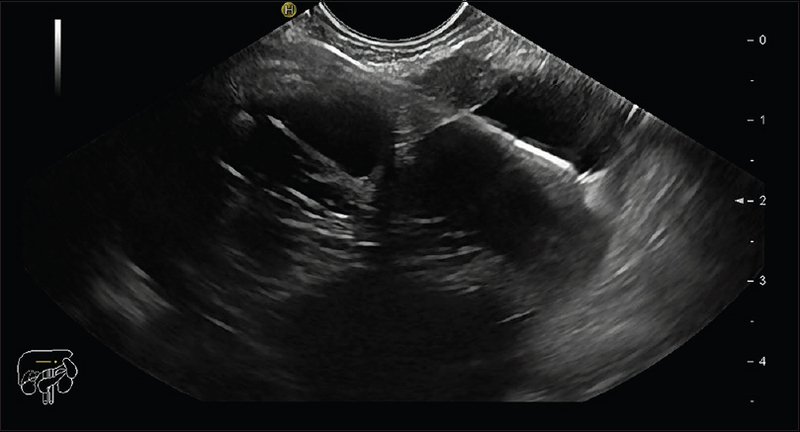 The patient that harbored the pseudocyst had previously undergone partial pancreatic resection due to a MCN and developed subsequently another cystic lesion. As there was disagreement between cross-sectional and EUS findings, microbiopsies were obtained. Histological findings in this case showed multiple inflammatory cells, necrotic debris, and the absence of epithelial cells and were not diagnostic for a pseudocyst but confirmed the suspicion. Due to a synchronous malignancy in stomach, the patient underwent surgery which confirmed that the pancreatic lesion was indeed a pseudocyst. Immunohistochemistry (IHC) was used for supplemental analysis to confirm IPMN diagnosis. Four patients (17%) had inconclusive biopsies and were consequently defined as clinical failures. Of those, one patient had a 35-mm lesion in the body of the pancreas and supplementary cytology analysis of the cystic fluid was acellular. The patient was referred for surgery. Subsequent histopathological analysis revealed a cystic NET. The second patient had a 32-mm lesion in the tail–the microbiopsies showed nonspecific glandular tissue. Cytology showed bloody sample with a few leucocytes, but no epithelial cells. Subsequent EUS-FNA-guided needle-based confocal laser endomicroscopy (nCLE) diagnosed this patient with a branch duct (BD)-IPMN, which was supported by cyst fluid CEA concentration of 136,200 ng/mL. The third patient had a 52-mm lesion in the head of the pancreas. Microbiopsies showed fibrous material, with some lymphocytes, granulocytes, and occasional epithelial cells (Cytokeratin-positive) with no atypia. Cytology was conjointly inconclusive. A follow-up in 6 months was scheduled. Finally, the fourth patient had a 15-mm lesion in the head of the pancreas; however, the amount of tissue obtained was insufficient for a diagnosis. Cytology was inconclusive and cyst fluid CEA and CA19-9 concentrations were 18 ng/mL and 206 ng/mL, respectively. The patient was instead scheduled for follow-up in 6 months. Of 28 patients included, five underwent surgery, and thus gold standard (surgical resection) was available in 17.9%. Two moderate and one mild adverse event were recorded (10.7%). One patient was hospitalized due to nonspecific abdominal pain and was treated with analgesics. Normal serum-amylase was noted and the patient was discharged the following day after the symptoms resolved. Two patients suffered acute pancreatitis in mild forms and were hospitalized for 4 and 6 days, respectively. They were treated with intravenous fluids and analgesics and recovered completely. No severe or fatal adverse events were observed. Slight echogenic changes were seen after the acquisition of biopsies in two patients (7.1%), which may be due to minimal bleeding from the biopsy site. This however, did not result in any deviation from the standard treatment protocol, and were as such not classified as adverse events. The patients were followed according to the international consensus guidelines, and the median follow-up time was 8.4 months (IQR = 7.3–10.3). The use of microbiopsy forceps in pancreatic cysts was until now only reported in case reports. Technical success of 85.7% is relatively high and comparable with other studies of EUS-FNA in cystic lesions of the pancreas (66%–100%). Technical failure seems to be caused by loss of flexibility of the echoendoscope when both forceps and the FNA needle are inserted. Other technical difficulties described did not hinder procurement of the specimens. Failures were seen in locations where EUS-guided puncture is known to be challenging, i.e., when the echoendoscope was placed in the duodenum. 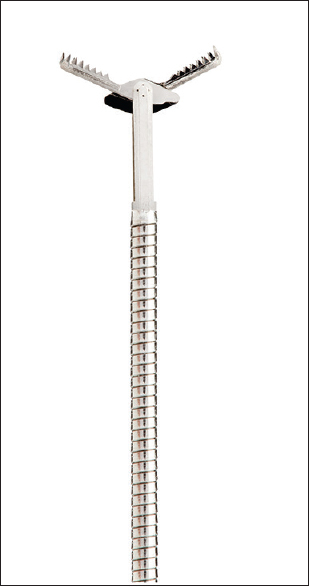 The majority of the procedures was performed using a flexible nitinol needle (n = 18 of 28 cases included– Boston Scientific Expect Flex Slimline™), but no firm conclusions can be drawn on the potential role of needle flexibility in the ability to obtain biopsy samples with the microbiopsy forceps. Even though no severe or fatal adverse events were recorded, a rate of 10.7% is notable and should be interpreted with caution due to the limited number of patients. Adverse event rates reported in EUS-FNA of the pancreas range from 2% to 10%.,, Further studies are needed to evaluate this. The possibility of obtaining histological specimens from the cyst wall with the use of this novel microbiopsy forceps could change the management algorithm of pancreatic cysts drastically. Biopsies extracted in this study contained sufficient material for supplementary IHC analysis, allowing for even more accurate histological diagnosis, and in the case of IPMNs, possibly histological subtyping. When compared to gastric and oncocytic subtypes, pancreatobiliary and intestinal subtypes are associated with progression to high-grade dysplasia and invasive carcinoma. 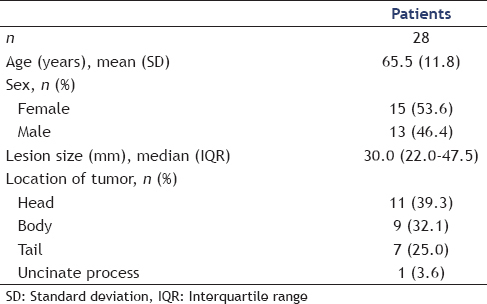 Previously, surgical series have shown that the clinical behavior of an invasive carcinoma derived from the pancreatobiliary type IPMN has a significantly poorer prognosis than those associated with the intestinal subtype., Furthermore, mutations in genes controlling cell cycle and arrest (KRAS, CDKN2A, and SMAD4,) or DNA repair (TP53) seem to provide valuable information for accurate preoperative diagnosis, helping to classify mucinous neoplasms, and high-risk cysts that require surgical resection. In addition, the procurement of cellular material from the cysts enables next-generation sequencing (NGS) and testing for possible mutations in the genes mentioned above. When combined with microscopy and IHC, NGS can potentially increase diagnostic accuracy and lead to a personalized approach when deciding treatment strategy. On the other side, acquisition of histological samples could not only be used to identify malignant or premalignant lesions but also to confirm benign diagnosis in others, which may terminate the follow-up much earlier and save health-care systems for expenses. In this study, three patients (10.7%) were diagnosed with benign cystic entities, which did not require further follow-up. In another comparable diagnostic modality, nCLE, a needle-based probe is used in conjunction with intravenously administered fluorescein, and offering a sort of real-time optical biopsy. The nCLE probe is inserted through a 19G FNA needle after successful puncture of the cystic lesion and used to examine the cyst wall on microscopic level. Studies conducted on the diagnostic accuracy of nCLE system seem promising with sensitivity rates of 57%–89% and specificity rates of 100% for sserous cystic neoplasms and IPMN.,, In addition, nCLE was able to correctly diagnose one of the patients in this study with BD-IPMN, where EUS-guided microbiopsies were inconclusive. Limitations of this study include a retrospective design and a small sample size. Furthermore, histopathological confirmation of the presumed diagnosis was only available in five patients. As the aim of this study was to present the initial experience with the EUS-guided through-the-needle microbiopsy procedure, the median follow-up time was limited (8.4 months). The use of the microbiopsy forceps seems feasible with acceptable rates of technical and clinical success, but due to observed possible high rate of adverse events it might be considered as an extension of diagnostic modalities available and not as a routine examination. Patients with cystic lesions with any of the worrisome features where surgery is considered might benefit from this form of extended diagnostics. However, prospective studies are needed to determine the true diagnostic potential of EUS-guided through-the-needle microbiopsy procedure compared to the other modalities currently in use. Brugge WR, Lewandrowski K, Lee-Lewandrowski E, et al. Diagnosis of pancreatic cystic neoplasms: A report of the cooperative pancreatic cyst study. Gastroenterology 2004;126:1330-6. Ngamruengphong S, Bartel MJ, Raimondo M. Cyst carcinoembryonic antigen in differentiating pancreatic cysts: A meta-analysis. Dig Liver Dis 2013;45:920-6. Suzuki R, Thosani N, Annangi S, et al. Diagnostic yield of EUS-FNA-based cytology distinguishing malignant and benign IPMNs: A systematic review and meta-analysis. Pancreatology 2014;14:380-4. Barresi L, Tarantino I, Ligresti D, et al. A new tissue acquisition technique in pancreatic cystic neoplasm: Endoscopic ultrasound-guided through-the-needle forceps biopsy. Endoscopy 2015;47 Suppl 1:E297-8. Tanaka M, Fernández-del Castillo C, Adsay V, et al. International consensus guidelines 2012 for the management of IPMN and MCN of the pancreas. Pancreatology 2012;12:183-97. Pham KD, Engjom T, Gjelberg Kollesete H, et al. Diagnosis of a mucinous pancreatic cyst and resection of an intracystic nodule using a novel through-the-needle micro forceps. Endoscopy 2016;48 Suppl 1:E125-6. Wang QX, Xiao J, Orange M, et al. EUS-guided FNA for diagnosis of pancreatic cystic lesions: A meta-analysis. Cell Physiol Biochem 2015;36:1197-209. Gress F, Michael H, Gelrud D, et al. EUS-guided fine-needle aspiration of the pancreas: Evaluation of pancreatitis as a complication. Gastrointest Endosc 2002;56:864-7. Eloubeidi MA, Chen VK, Eltoum IA, et al. Endoscopic ultrasound-guided fine needle aspiration biopsy of patients with suspected pancreatic cancer: Diagnostic accuracy and acute and 30-day complications. Am J Gastroenterol 2003;98:2663-8. Choi JH, Seo DW, Song TJ, et al. Long-term outcomes after endoscopic ultrasound-guided ablation of pancreatic cysts. Endoscopy 2017;49:866-73. Adsay NV, Merati K, Basturk O, et al. Pathologically and biologically distinct types of epithelium in intraductal papillary mucinous neoplasms: Delineation of an “intestinal” pathway of carcinogenesis in the pancreas. Am J Surg Pathol 2004;28:839-48. Kim J, Jang KT, Mo Park S, et al. 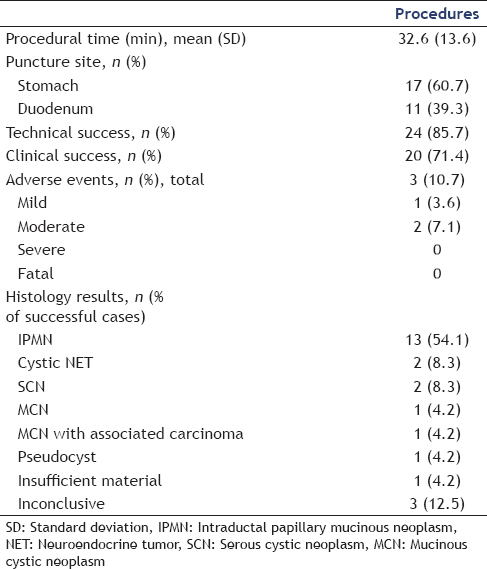 Prognostic relevance of pathologic subtypes and minimal invasion in intraductal papillary mucinous neoplasms of the pancreas. Tumour Biol 2011;32:535-42. Sadakari Y, Ohuchida K, Nakata K, et al. Invasive carcinoma derived from the nonintestinal type intraductal papillary mucinous neoplasm of the pancreas has a poorer prognosis than that derived from the intestinal type. Surgery 2010;147:812-7. Rosenbaum MW, Jones M, Dudley JC, et al. Next-generation sequencing adds value to the preoperative diagnosis of pancreatic cysts. Cancer Cytopathol 2017;125:41-7. Nakai Y, Iwashita T, Park DH, et al. Diagnosis of pancreatic cysts: EUS-guided, through-the-needle confocal laser-induced endomicroscopy and cystoscopy trial: DETECT study. Gastrointest Endosc 2015;81:1204-14. Konda VJ, Meining A, Jamil LH, et al. A pilot study of in vivo identification of pancreatic cystic neoplasms with needle-based confocal laser endomicroscopy under endosonographic guidance. Endoscopy 2013;45:1006-13. Napoléon B, Lemaistre AI, Pujol B, et al. A novel approach to the diagnosis of pancreatic serous cystadenoma: Needle-based confocal laser endomicroscopy. Endoscopy 2015;47:26-32. 2 Will New Instruments for Endoscopic Ultrasound-Guided Tissue Acquisition Make Us Happy?